Exclusive Interview with Kristofor Mellroth, Audio Director of "Crackdown 2"
Designing Sound: How long was Crackdown 2’s sound in development and how did you collaborate with the rest of dev teams on the game? 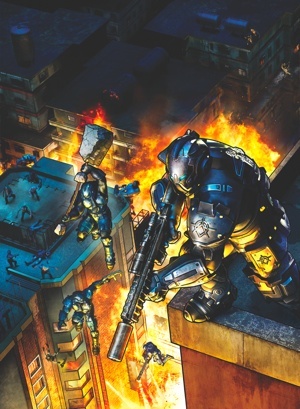 Kristofor Mellroth: My relationship with the development team at Ruffian was one of shared history, since I worked with most of them on Crackdown 1. Ross Nicoll (Audio Lead at Ruffian) and I have a very good working relationship and we knew we wanted to work together on Crackdown 2 again. At the beginning of the project I travelled to Dundee and pitched my ideas for creative pillars, staff, and schedule. I got signoff from both sides and started right in on staffing and preproduction. Crackdown 2’s development schedule for audio was essentially 12 months start-to-finish. The bulk of production took about 9 of those months. The other 3 months was spent on building a pipeline, hiring, scoping, planning, testing, and bug fixing. DS: In terms of sound, what were the most challenging changes in the sequel? What did you want to improve or change? KM: By far the most difficult thing about doing a Crackdown game is the fact that the entire game is co-op, non-linear, and open world. With this design every system you make must support every game mode and every scenario in every game mode. 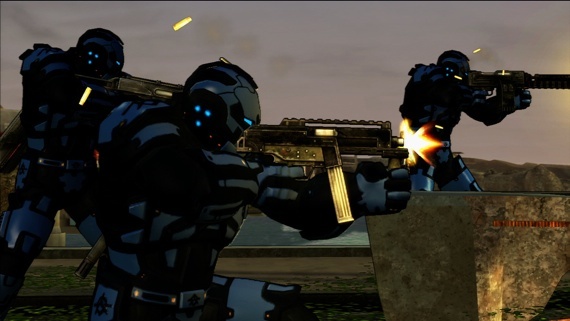 Player characters can create an enormous scale of sounds in Crackdown and with the introduction of 4 players, the potential for audio mayhem goes through the roof. You can make something sound awesome, but can you also make it sound awesome when 4 players do it side by side? There are a few things we wanted to improve this time over the last. #1 Sandbox audio fidelity. We think CD1 has a very cool and unique sound but we could not be satisfied with the past. We wanted to push the sandbox sound design in every area further. This meant redesigning every system from both a technical and aesthetic level. It meant all new field recording. It meant expanding the sandbox and trying to get more memorable sounds into it while not overwhelming the player with repetition. #2 authoring environment. Our previous tech was cool but very specific. We needed something more flexible and more up to date with things like live update, synthesis, dynamic mixing, etc. Something that allowed collaboration across oceans and timezones. This was an easy choice and we immediately selected Wwise as our environment. #3 Emotional impact. The last game’s sound was 100% simulation. This helps give the game a very unique sound but also leaves it emotionally flat during big moments. We wanted to give the game more emotion this time and elected to add an original score as our primary solution. This worked extremely well in a game like Crackdown 2. Much better than we could have envisioned. We got such a great score and it’s integrated in very unique ways. The beginning, end, life, death, day, night, height exploration, and races all feel much more impactful this time around. DS: How does the non-linear open world gameplay and multi-player cooperation changed the way you design/implement sound in the game? KM: It’s extremely difficult. Any time you want to cheat on a radius for a sound to make it louder or put in extra detail, you find that the scale of 4 player Co-op, memory restrictions, or the lack of linearity makes it exponentially more challenging. For instance, there are many sounds that can occur at any time, but only rarely. Players can drop in and out of your world and bring a completely unique set of weapons, actions, and equipment with them. One can be in a freak lair, activating a beacon while you are gliding off a 100 story building over a firefight. Below is a partner racing in a supercar while another friend is flying a helicopter and strafing bad guys on the street. In each scenario you must ask yourself, “what should the player be hearing here?” and both mix and design your technology to support this. We are very committed to “full simulation” as a key strength for Crackdown. With this challenge in mind, you cannot simply drop what the other person is doing. You must integrate what they are doing in to the overall soundscape and make sure that it doesn’t interfere with the players’s actions. Every radius and every setting on each sound must be tuned and tested. For instance, up close you want a missile launcher’s “launch” sound to be louder than the missile trail, but the missile trail must be audible over a great distance. The explosion needs to not only be audible over a massive distance but must also change in character relative to how dangerous it is to the player. 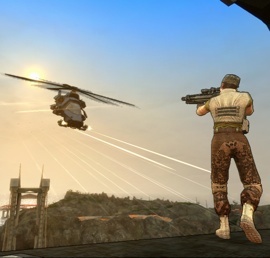 It must also have a unique signature so the player can identify what is firing at them, but that sound only needs to be audible when lethal. Now multiply this by 5 enemies with rocket launchers and 4 players with rocket launchers and it lets you know that you must be very disciplined with how you build this out for it not to turn into audio mayhem. DS: How do you use sound to enhance the player’s experience? What techniques did you use to develop sound design for the sequel? KM: We use sound design as the basis for the entire game. Music comes and goes based on the scenario, VO gives the human element and a visceral reaction to player input or instructions on how to play. We intentionally gave no vocalizations to the Agents this time. Your interaction with the world and your voice are 100% sound design. This is a difficult and unique challenge to keep unique but one we really enjoy. Sound design is used for a number of key features. #1 player identity – each object, each interaction has a unique sound design. this is 100’s of objects, vehicles, weapons, etc. Uniqueness in sound design replaces the voice of the agent. It gives each action an identity. #2 player feedback. – How far am I from something? What is near me? What am I holding? What am I doing? Am I safe, or in danger? What am I fighting? Is it alive or dead? What is shooting at me? What am I driving? What are they driving? Am I damaging it? All of these bits of information are built into the game through sound design.. Due to unique designs for everything, our goal was for the player to be able to close their eyes and know what’s happening. DS: Did you use any sounds from the first title? 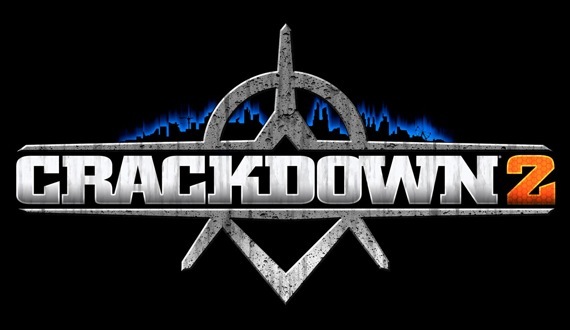 How many new recordings was needed on Crackdown 2? KM: The only sounds kept from the original game were the sounds of the agility and hidden orbs and the agent level up sound. These were sounds we identified as part of the brand identity. Everything else was based on new field recordings and sound design. This includes weapons, vehicles, foley, missions, ambience, etc. We wanted a fresh new sheen on everything and didn’t want to sound like an audio 1.5. We wanted a full 2.0 experience so we left no stone unturned. This ended up taking a lot of effort, but at MGS we accept no compromises. Quality and achieving our own goals are the only thing that matters. It was an incredible amount of work to accomplish in 12 months but we did it and we wouldn’t have it any other way. DS: In an interview with Joystiq, you talked about challenges and techniques used on the explosions/weapons sounds, could elaborate more on that process? KM: Yeah! My favorite subjects! :) We can talk assets and we can talk implementation. First, asset-wise we recorded everything unique for Crackdown 2. This includes a 25+ weapon gun shoot and a class C explosives session. Locations were scouted and tested before hand. We got blown out by the wind during our first gun session and had to book a 2nd at a different location. The end results are very unique, very impactful and very satisfying. Second, Implementenation. Essentially, there are three things that govern the weapon system. Player VS non-player, player level, and weapon type. Player weapons have 5 layers. Weapon muzzle flash left & right (independent), weapon dry fire, unique sweetener, LFE and rumble. Player weapons change gain and pitch based on player skill level. In short, gain goes up on some layers, pitch comes doen, and the stereo field widens as the firearms level increases. NPC weapons have muzzle flash and unique distant assets that crossfade over distance. NPCs use only the left set of the player’s muzzle flash as theirs. this lets us not carry all the player detail for every weapon, only the three potential weapons the player can carry (primary, secondary, and turret). For explosions, there are 10 levels of explosion in the game from small lvl 1 grenade to what we call “NUKE”. Each explosion is 5 layers. 1 stereo “blast” that widens as it’s closer to the player. “boom” that is the deep thud of an explosion that both sweetens up close but also help simulate distance. This has a huge audible distance so you can hear explosions that happen on another island. LFE to give power to home theater users, and an explosive object sweetener to let you know if it was a car, a propane tank, a grenade, or a gadget that has exploded. Each layer has variation and we have 4 levels for each type of layer that change based on the explosion level. That’s a lot of assets dedicated to explosions! The end result, we really enjoy. It never gets old to blow s*!t up in Crackdown 2. DS: How did you deal with the different environments and locations in Crackdown 2? What kind of places you recorded? How you structured the different layers? KM: Because we do so much simulation, we opted not to go too crazy with base environmental detail. The world is carved up in volumes per region and uses a simple ambient loop paired with random one-shots to give flavor to the world. Ambience changes with height as well, with one-shot detail falling away and the base turning into an elevation-appropriate loop. There is a lot of detail put into the reverb design, which is a separate hand-crafted volume based system. Reverbs for underpasses, alleys, forest, streets, etc are all tuned differently and actually pretty wet in mix to help bring everything into a unified sound. One of my favorite things to do is drive a car under an overpass and bail out while hearing the music move from 2d to 3d and switch to the reverb system. DS: What are your favorite tools for sound design? Is there any special processes or techniques you used for Crackdown 2? KM: Sound design for this really takes place in two places. First in the DAW environment and second in the game authoring environment. Because of the way we construct sounds, you really have to plan extensively so this process is smooth and everyone is on the same page. For the DAW environment we all like different stuff. Soundelux and MGS Soundlab both use ProTools. Jeff and Ross like Nuendo. I like Audition. We don’t mandate an environment, we let everyone work in what they like. But they have to finish the feature since we can’t move sessions between machines. This encourages ownership and accountability which we like, but at the expense of flexibility. One of the unique production techniques we used on the game can be heard in the NPC vocals. The way they sound, like people shouting on a city street, is a combination of recording technique (large room, boom operator) and in-game delay and reverb. The in-game authoring environment I’ll cover below, but please consider it just as important as the asset creation pipeline for the sound of Crackdown 2. DS: There is an interesting approach to music and it’s relationship with the environments and moments in the game, what ideas were behind the way music was used? KM: We have a lot of music in Crackdown 2 and we are really happy with out it came out. There was a goal of more emotional impact from the original score and a more recognizable soundtrack in the form of Cell faction songs. We also wanted to contrast areas of ownership through music, so Agency controlled areas play ambient music through the world only in the form of video Billboards and reclaimed strongholds. Citizens only control their own vehicles and folk songs on the street. Cell music comes from both Cell-controlled areas (PA speakers) and vehicles that are loud and can be driven into Agency controlled areas. FMVs for intro, outro, and epilogue. Each of these are tied together by a main theme that we consider part of our brand identity, alongside the famous Agility orb sounds. DS: In the first game, there are a lot of cool ways you implemented sound, such as environmental reverb, psychics calculations, etc. How was this improved in Crackdown 2? Could you tell us more about the tools/system you use for implementation? KM: For the authoring environment, we choose Wwise because it is the best, most flexible, most collaborative and fully featured toolset out there. There were so many benefits to this… we were able to quickly implement and hear our changes. We were able to trade work units internally and externally. We were able to mix and tweak quickly. We were able to tie almost every sound design into game parameters and really take advantage of morphing and changing sound design based on what’s happening in the game.I really couldn’t see us pulling off CD2 with any other toolset due to the complexity of what we did. We made some good decisions early on that helped us every time we tackled a new system. Almost everything is based on switches and RTPCs. We have switches for player vs non-player, character type, object type, weapon type, vehicle type, surface type and many more. We have RTPCs for impact intensity, tire grip level, object speed, pitch and roll. Each of these can be used to create a unique sound for an object. For instance, the player picks up a car that has a co-op partner driving it and throws it into a building, then it falls into the water. We play a unique “pick up object” sound based on the object type (car). The suspension expands, determined by the vehicle type. The co-op player revs the engine, which has induction, engine, and exhaust simulation determined by a switch of vehicle type and RTPCs of RPM and throttle position. 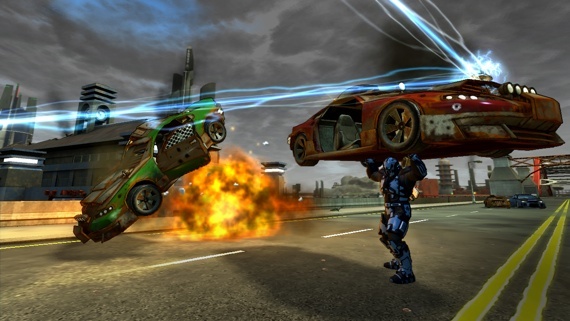 The player throws the car, generating a whoosh of SoundSeed Whoosh, which changes based on an RTPC of player strength level. The car flies through the air, generating a wind rush for the partner in the vehicle based on speed. It impacts the surface of the building and creates three sounds. One of the object impact, switching on object type (car) and an RTPC of impact intensity (medium), an LFE sweetener with a tight radius to give the sense of scale to home theater owners that switches on object size, and the surface of the building (stone) before falling into the water creating a splash that switches based on object size (large splash). It’s extensive, detailed, and a little bit insane, but we’re really proud of it and we hope you like it. Thanks for the chance to tell our story!